Thu., Sept. 28, 2017, 5:55 a.m.
September-November: Washington Department of Fish and Wildlife collects public comment at meetings and online regarding proposals to simplify fishing regulations for freshwater species. Oct. 27-28: Fish managers to brief Washington Fish and Wildlife Commission in Olympia regarding proposed regulations changes. Nov. 30: Deadline for public comment. Dec. 8-9: Fish and Wildlife Commission to take public testimony at meeting in Olympia. Jan. 19-20: Commission to take action on sport rule proposals. Note: This column has been edited from its original post to remove reference to bass anglers’ opposition to a five-bass limit. No such proposal has been made by the state, and some bass anglers likely would support the concept if it were proposed. Only 18 anglers showed up on Tuesday night at Center Place in Spokane Valley for the meeting on proposals to simplify Washington’s fishing regulations. At first glance, the skimpy attendance suggested there wasn’t a lot of concern about 14 proposals that could change the nature of fishing and fisheries. Of course, many anglers are choosing to comment online, but attending a meeting with six Washington Fish and Wildlife Department fisheries biologists available enables questions to be asked and misunderstandings to be addressed. Fifteen of the 18 anglers at the meeting were local bass fishermen and they had LOTS of questions. They were driven by a fishing passion that gobbles up a good chunk of their life and finances traveling to tournaments and maintaining boats and gear. They love to catch bass, and the bigger the better. They were at the meeting to let Chris Donley, the state’s regional fisheries manager, know that they opposed a statewide rule (with exceptions) for bass with no daily limit or size restrictions on rivers and streams. The result would be a quick loss of the larger fish they pursue with every cast, the bass anglers said, especially in the case of largemouth bass at area lakes. Bass anglers already are reeling from the removal of limits or size restrictions on bass – mostly smallmouths – in the Columbia and Snake river systems where native salmon and steelhead run. Endangered Species Act requirements protecting some of the struggling salmon and steelhead dictate many of the Columbia’s fisheries policies, Donley said. Tournament bass anglers take pride in a catch-and-release ethic. Their goal is to catch a big bass to win a tournament and then release it alive so it can be caught again by another angler. But with no restrictions protecting larger bass, they’re seeing meat fishermen whacking fish indiscriminately, bagging the large bass with glee. While that’s legal, it seems worth noting, at least, that older and larger bass contain the most pollutants. They are best suited for being caught and caught again rather than being eaten. Donley responded for nearly an hour to their concerns. He said exceptions can be made to the rules on rivers and streams in the cases of reservoirs such as as Lake Roosevelt and the pools on the Pend Oreille River, as well as Banks Lake, because they don’t host salmon runs. Anglers may take a toll on larger bass where there are no restrictions, but Donley says the main reason the size of smallmouth bass has declined at the weigh-ins of area tournaments is overpopulation. “They’re smaller and skinnier because there’s just too many of them,” he said, noting that smallmouth numbers have boomed in the past 10 years. “Largemouth: No min. size, only largemouth less than 12 inches may be retained, except 1 over 17 inches may be retained. Daily Limit 5. Donley encouraged the anglers to make their comments so they can be compiled with input from other anglers across the state and presented to the Fish and Wildlife Commission. Other proposals seek to simplify a wide range of rules. Many current restrictions for specific waters – often sold in the past as ways to provide more opportunity and bigger fish – would be dropped. 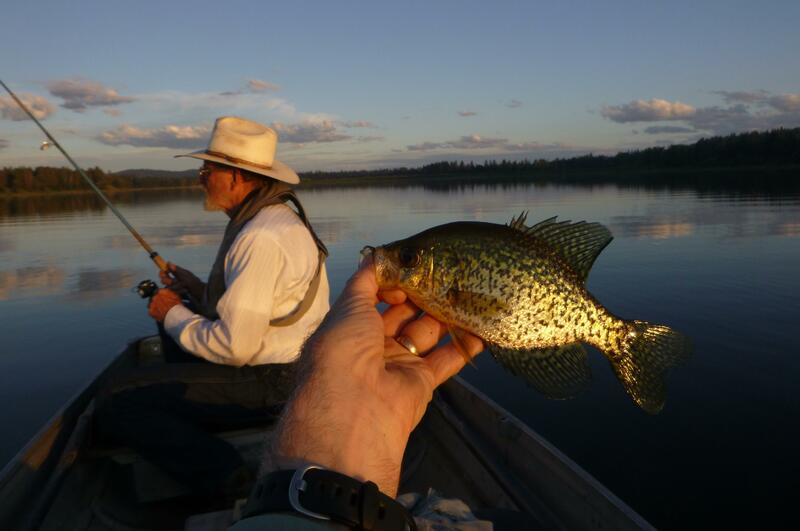 For example, the 9-inch minimum length limit for crappie meant to boost numbers of catchable size fish at lakes such as Eloika could be eliminated and returned to a statewide rule. Standardizing the statewide season for rivers, streams and beaver ponds to the Saturday before Memorial Day through Oct. 31. Eliminating mandatory steelhead retention in most waters. Reducing the complexity of regulations – such as daily limits, size limits and seasons – in lakes and ponds. Some proposals are still being worked out. Specific recommendations for trout and any changes for waters such as Spokane River and Amber Lake will be released around Nov. 1, said district biologist Randy Osborne. Rescinding the ban on chumming and allowing it statewide. Removing limits and restrictions on brook trout statewide, with possible exceptions for intact lakes such as Fish Lake in Spokane County. This is the first year of a three-year effort to simplify sportfishing regulations throughout the state. Next year, fishery managers are scheduled to work on salmon fisheries in marine and freshwater, while fisheries for shellfish and other marine fish will be addressed in 2019.
Review and comment on current proposed rules through Nov. 30 online. For a printed copy of the proposed rules, call (360) 902-2700. Published: Sept. 28, 2017, 5:55 a.m.